One of our most luxurious Indian Wedding Invitation lines is Charu Papers. 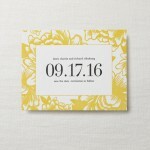 This Invitation line is elegant, colorful and whimsical. Charu is an expert in using exciting colors, bold designs to accomplish striking results when it comes to stationery products. We carry Charu Papers’ Wedding, Bar Mitzvah, Bat Mitvah and Save the Date Invitation Collections. Charu Papers not only provides Indian Wedding Invitations, but exotic designs for any cultural or vibrant wedding. We would recommend this Invitation Line for Indian, Afghani, Persian, Asian and Jewish Weddings and Events. Whether it’s for a fantastic Save the Date Invitation or an elaborate Far East Wedding Invitation, this selection of foils, patterned liners, silkscreen printing, and vibrant inks and details make a splash yet is still modern and cutting edge. The above example of an Indian Wedding Invitation which can also be used for Asian, Afghani or other cultural wedding is such a delight, it looks like a candied-jewel! This boxed invitation comes as is in vibrant pink, floral design on it’s borders and a peek-a-boo cut out to accent the wedding couple’s names embellished with bark skin, textured papers in the background or you can customize this invitation with your theme and colors. Please see our Charu Papers Page for more designs. 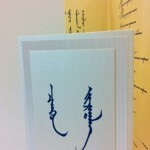 The above example of an Indian Wedding Invitation is by Charu. This example is the inside of the Boxed Wedding Invitation. 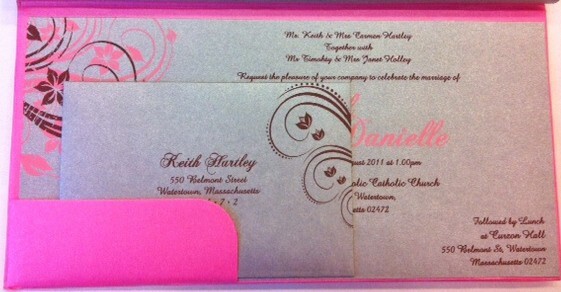 The outer layer is pink and the inside is complementary silver with accompanying silver rsvp card and return envelope. 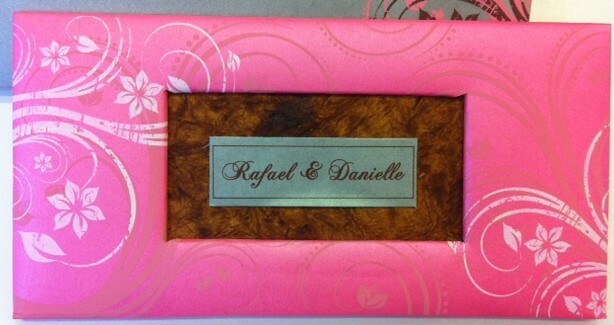 The invitation is printed in brown ink and the bride and groom’s names are printed in matching pink ink. For more examples please see our website or come in to Hyegraph Embarcadero in San Francisco, located in the Financial District at the Embarcadero Center. To see Scroll Invitations and Scroll Wedding Invitations please see our Scroll Wedding Invitations Category.